That’s not a church on the side of the road, overlooking Sydney Harbour. If it was, it would be one of the ugliest churches ever built. 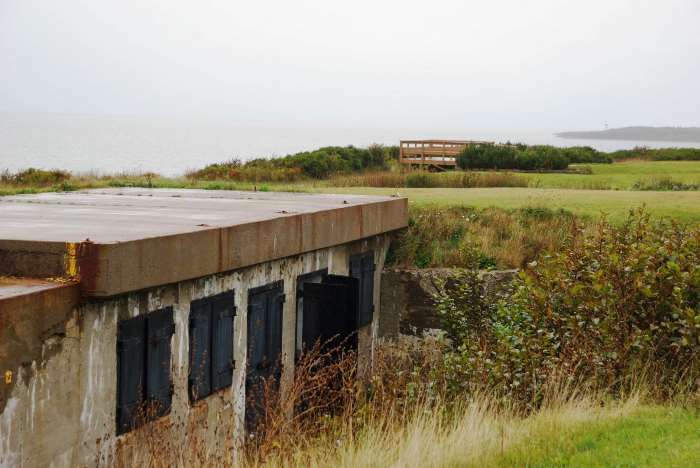 Take a second look and you’ll discover that this is Fort Petrie — an old military fortification that helped guard Cape Breton during the First and Second World Wars. 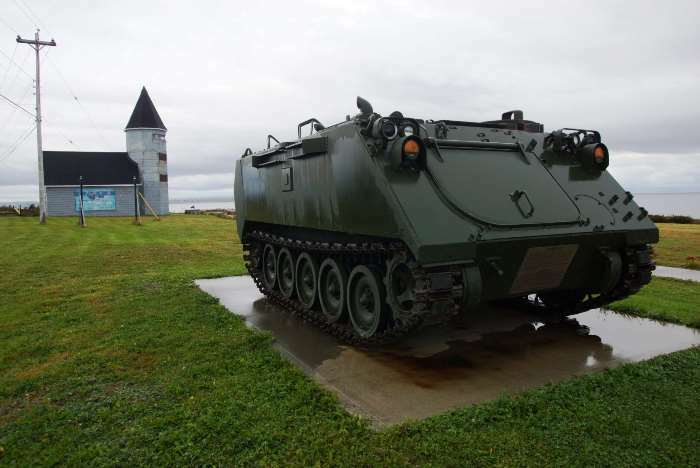 You can explore old gun emplacements and check out an old tank and mortar gun. 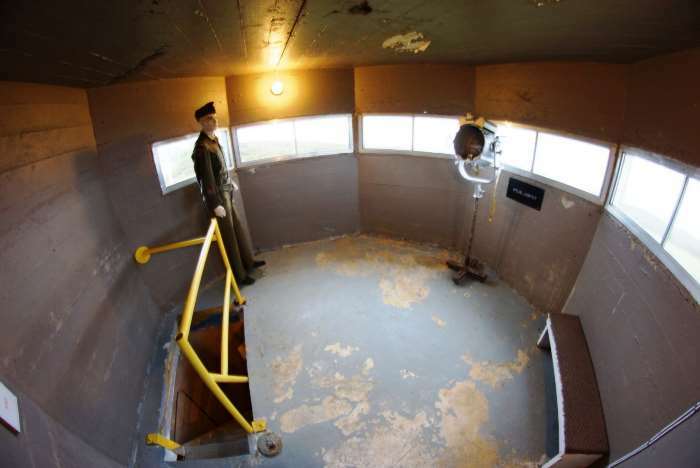 And if you’re lucky, you can step inside that ugly building — the Battery Observation Post — which is filled with military memorabilia. 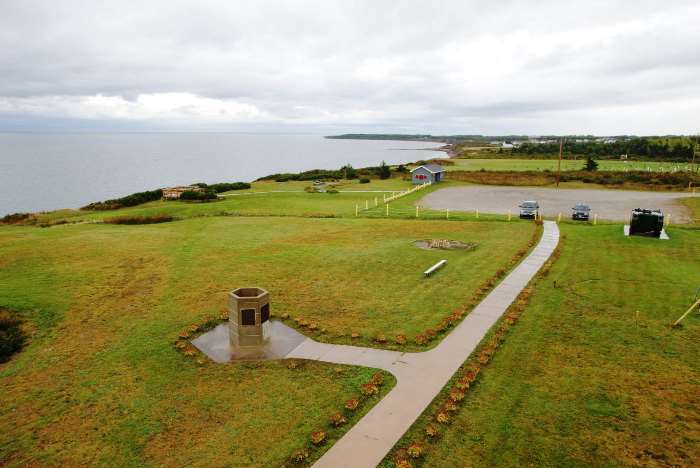 Fort Petrie is located 16 kilometers north of Sydney, Nova Scotia, along Trunk Route 28. 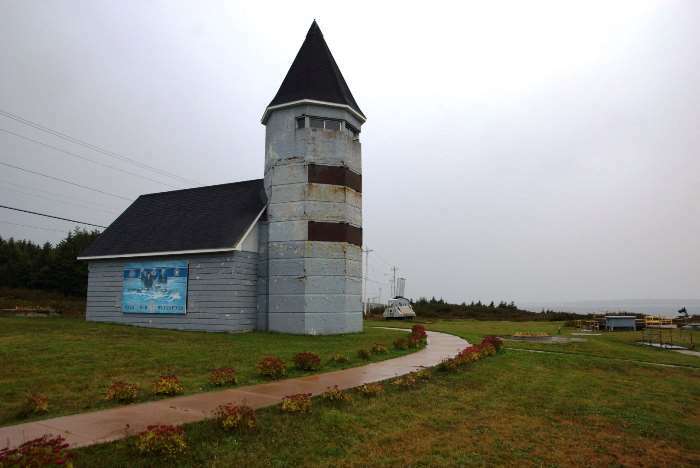 It’s just north of the Old Stone Church and south of Low Point Lighthouse – two other worthy attractions along this scenic route. Fort Petrie caught my eye as I drove up Route 28 to Low Point Lighthouse, hoping to arrive in time for a sunset at the end of Day 4 of this trip. Because I was in a hurry, I didn’t have time to stop here, but it sure did look interesting from the road. My interest probably would have slipped out of my mind if I hadn’t met Rob Grezel. He lives near Low Point Lighthouse, and he struck up a conversation with me as I returned to my car, after sunset. Rob is the caretaker of Fort Petrie, and he offered to give me a tour sometime. I realized that I was leaving Sydney the next day, and “sometime” would have to be the next morning, before I left town. And so, I arrived, at 9 o’clock on Day 5, under cloudy skies and a drizzle of rain, for my tour. I was a bit earlier than Rob, so I took a walk around the grounds. 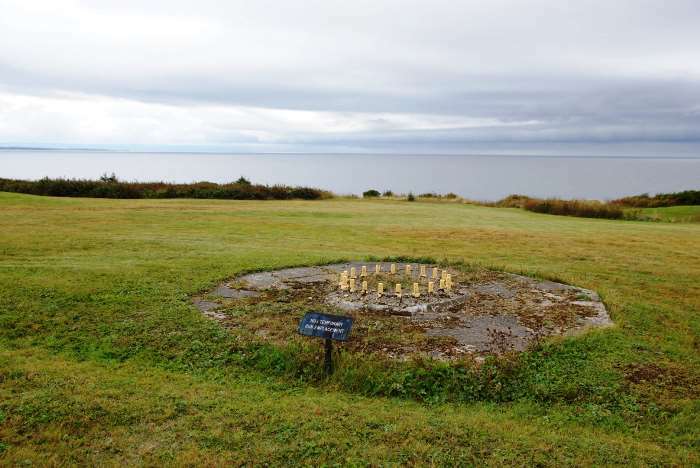 There are a couple of temporary gun emplacements poking up out of the grass. 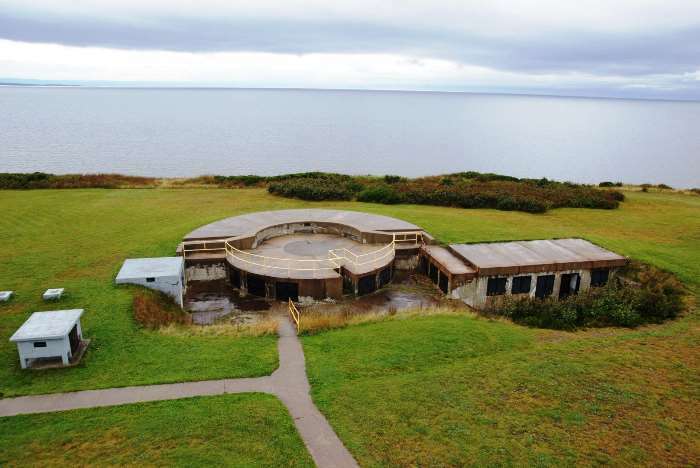 These were built in 1939, while the more permanent emplacements were under construction. 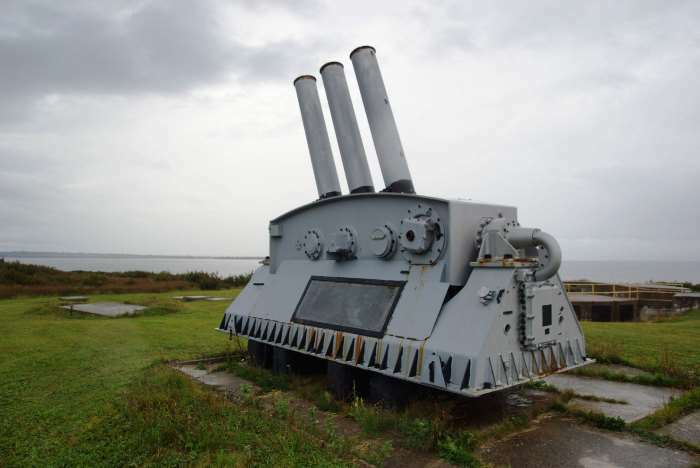 Those bigger gun emplacements weren’t finished until 1941. You’re free to climb around on these, but beware, the railings are rusty and some are missing. 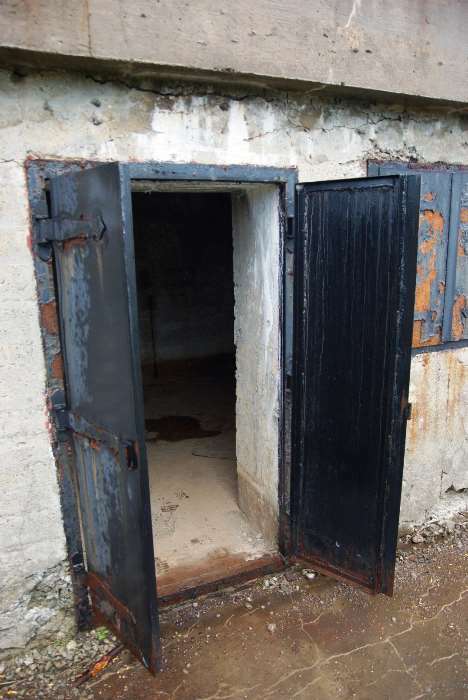 You might find the doors open to rooms underneath the emplacements. 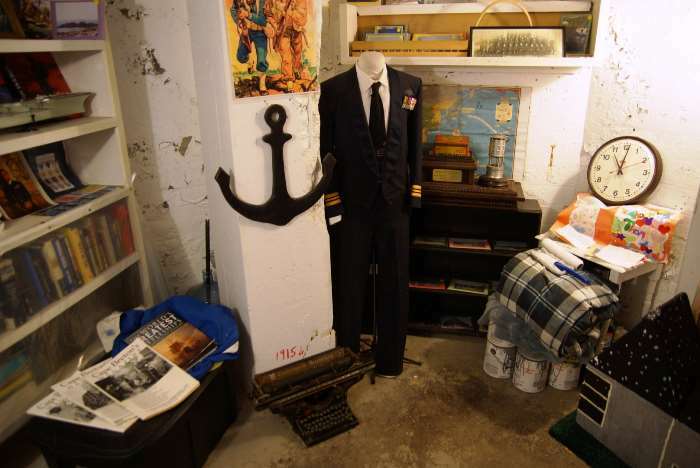 There is also an even bigger network of rooms buried underground. 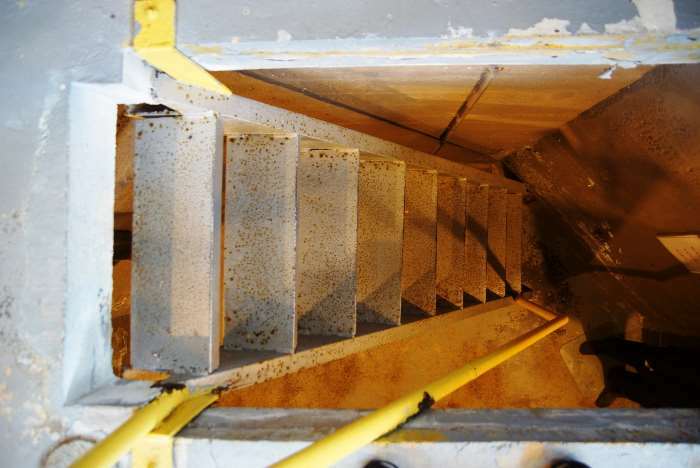 You’ll notice a couple of locked-up staircases that descend into the earth, to provide access. Once I had walked around the grounds for a few minutes, Rob arrived to unlock the B.O.P. 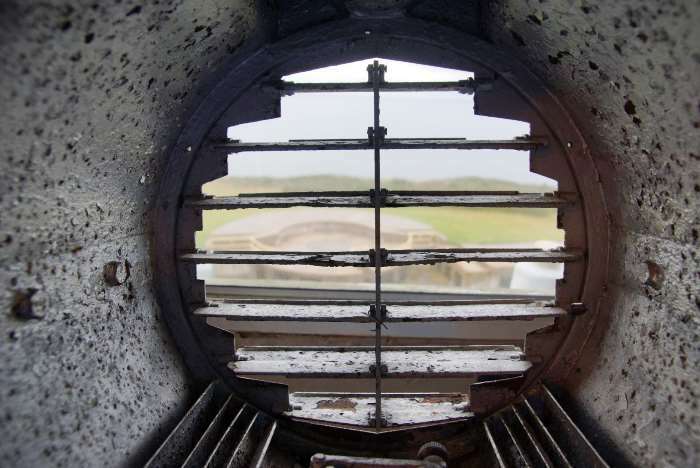 — the Battery Observation Post. The B.O.P. 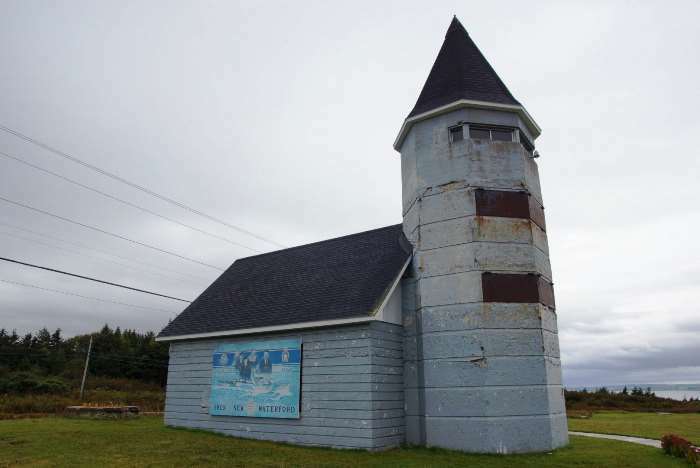 is the ugly church that served as a lookout and the nerve center of the base from 1939 until 1944. After that, another building (the C. D. X. tower) was constructed. 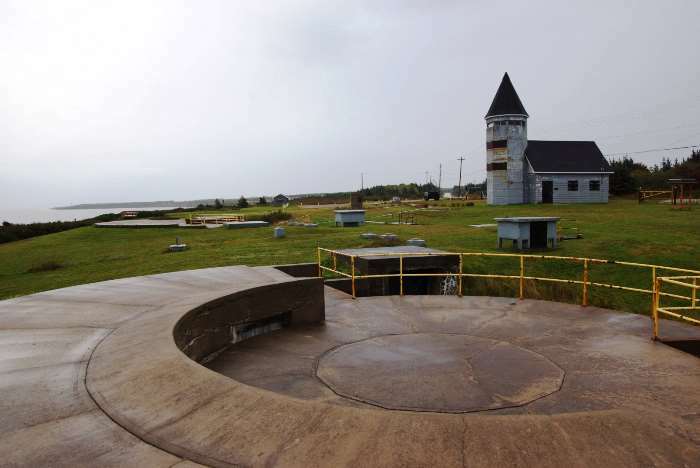 The C. D. X. tower was used until the fort was decommissioned in 1956. 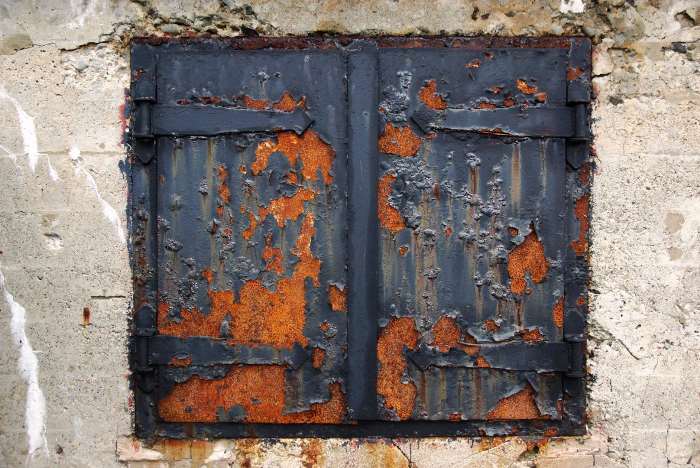 After that, it deteriorated, and was eventually torn down. Rob unlocked the B.O.P. 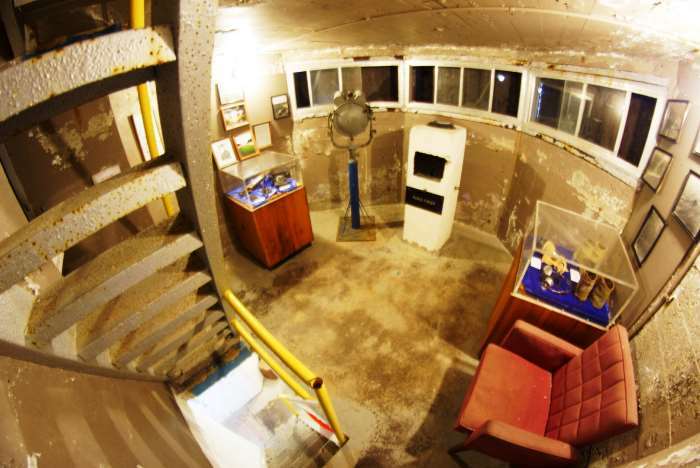 (it truly is locked up like a fort) and flipped on a few lightbulbs. He also handed me a flashlight to help me explore some of the shadowy corners of the museum. Inside, every inch is filled with something important, and you can ask Rob about any of it, and get the story behind it. … and on each level. Those windows are boarded up to prevent further damage from vandals. Rob spends a lot of time and money fixing damage and cleaning graffiti left by disrespectful park visitors. 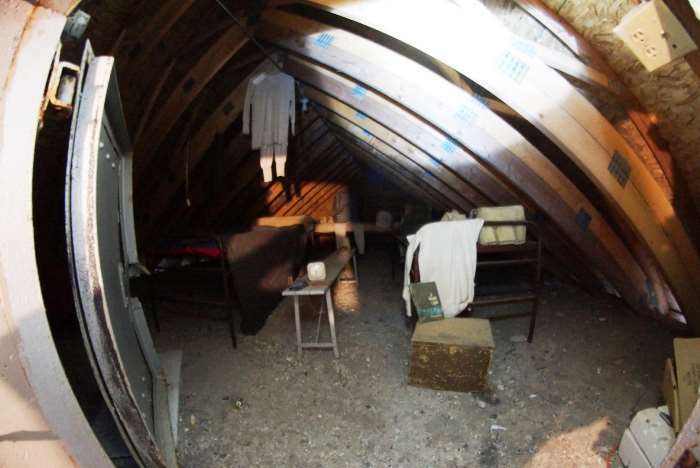 Halfway up the tower, you can glance into the attic space above the museum’s main room, which some of the troops would have used as a barracks. Clearly it was rough, uncomfortable living. … and look all the way up the coast. That spit of land on the horizon is home to the Low Point Lighthouse, which overlooks the entrance to Sydney Harbour. Rob told me numerous stories about the fort and the surrounding area. There used to be numerous installments, similar to this one, up and down the coastline of the harbor. A few still exist in ruins, but Fort Petrie is the only one that’s still in reasonably good condition. Rob explained how, during World War II, a net was stretched across the harbor at its narrowest point, to keep out invaders. He told of how one German U boat (submarine) slipped under that net one night. The Germans came ashore, had dinner with a local family, then returned — sending word back to Hitler that an attack on Sydney would be futile. 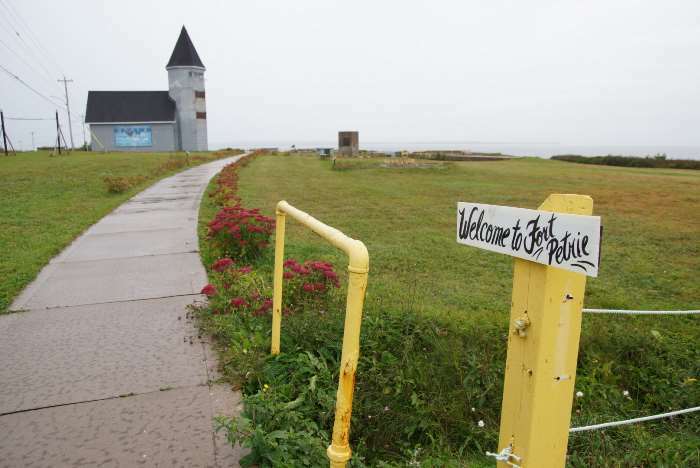 He said the old guns that were once mounted at Fort Petrie are now sitting in a scrap yard, somewhere on Cape Breton Island, but simply moving them would cost a staggering amount of money, which the museum does not have. I spent about an hour talking to Rob and looking around the museum. When it was time to go, some other visitors had stopped to look around, and Rob welcomed them. If he’s not there when you arrive, you can give him a call, and he’ll come open it up for you. 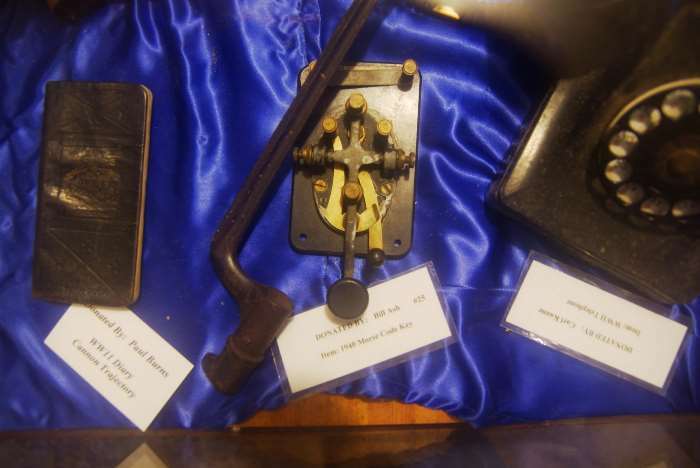 It’s remarkable to meet someone with a passion for keeping history alive, and preserving what’s left of the past. Drop a dollar or two in the donation box, if you can. 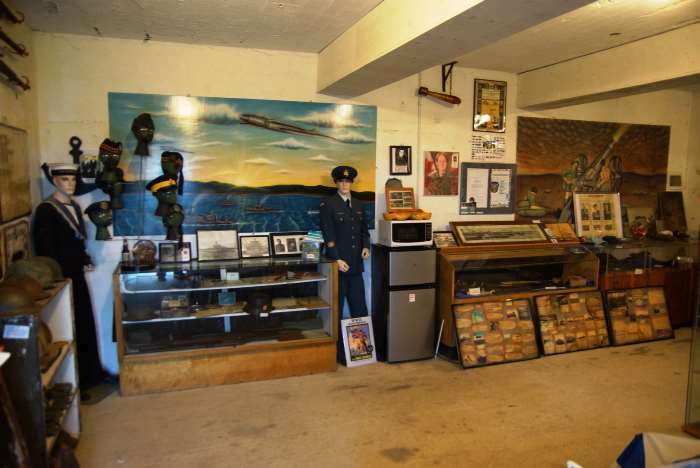 The fort’s military history combines with Rob’s enthusiasm to make this a very worthwhile stop, even if you don’t have any particular interest in the subject. There are old ruins to explore, and a great view of Sydney Harbour — both of which make this place worth a brief visit.